welcome on the road to Prokhorovka. 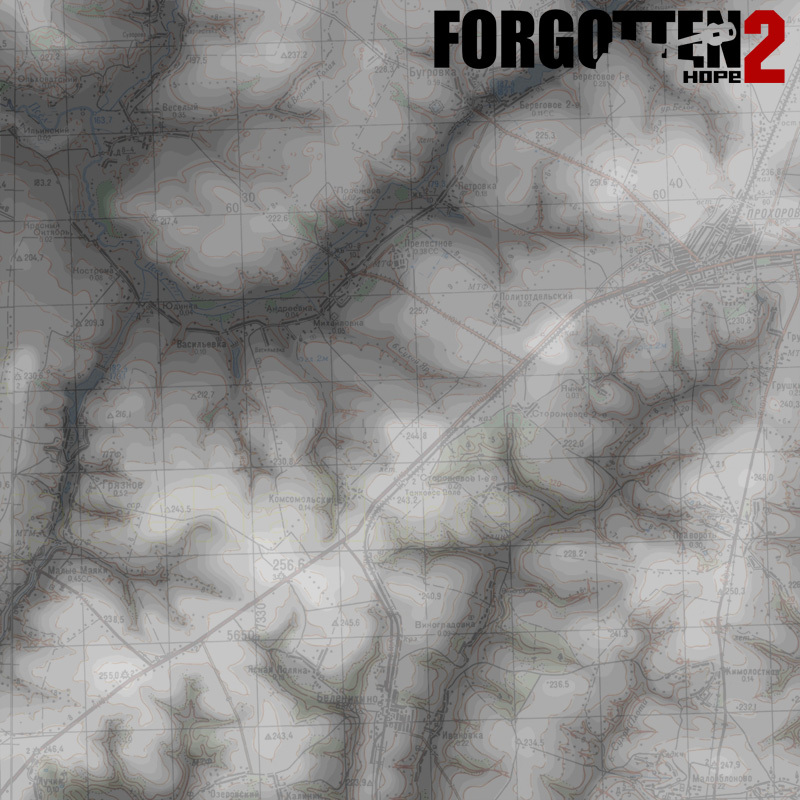 In this blog I'll share some insights into the developing process of one of our first eastern front maps. 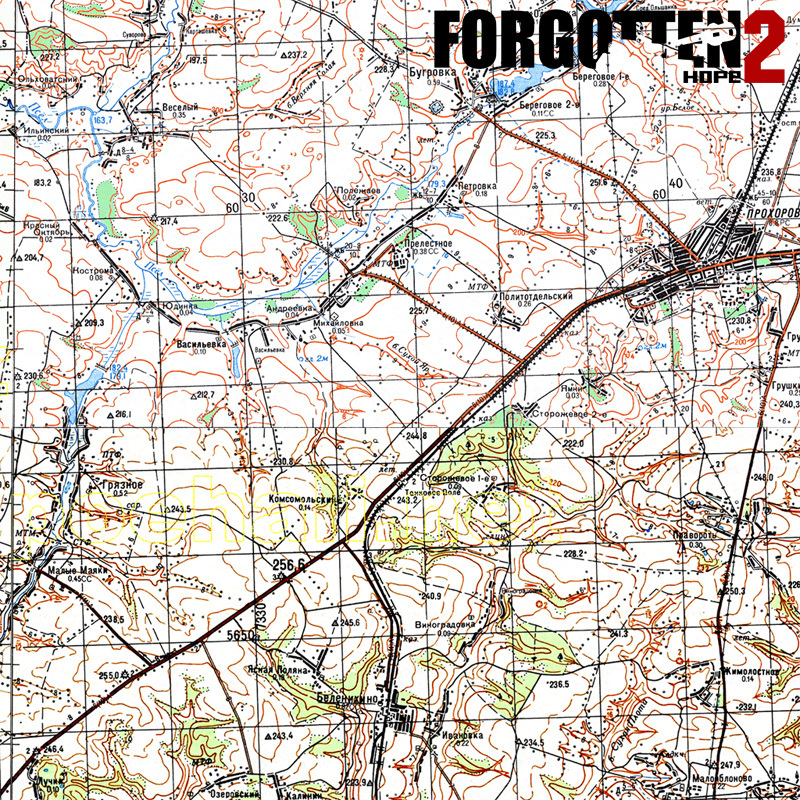 When we decided to do the eastern front it was clear that we wanted to include a map covering the actions during the Battle of Kursk to our first eastern front release. After it had been decided that I got the privilege to do that map, I started to do extensive research on what was going on during that battle and to figure out what kind of map would be best suited. After several days of research I narrowed the actions down to two scenarios that seemed to be suitable. 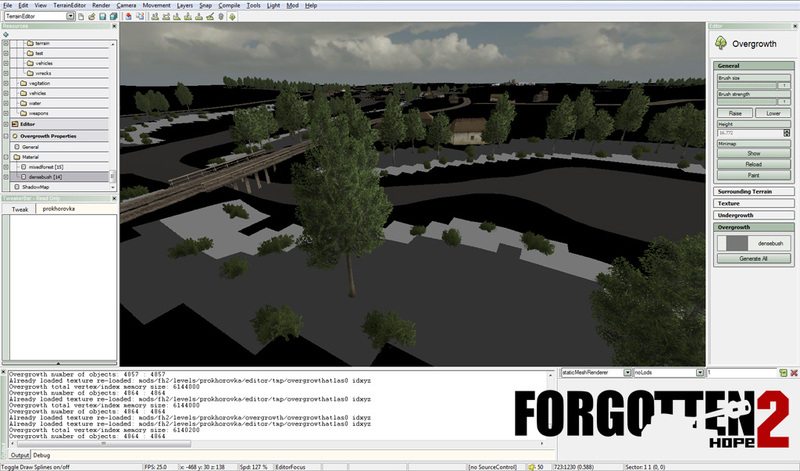 In the next weeks I developed concepts for both map ideas that included, a rough description of the gameplay I was aiming for, gaming area based on real terrain, heightmaps based on real terrain features, control point and vehicle layouts. It then was decided that Prokhorovka is the map we are going for. 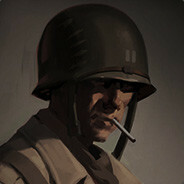 The reasoning behind it mainly has to do with it being easier to implement than Poniry which would have needed many more unique statics and vehicles. But also we had the feeling that a big tank clash outsidethe africa scenario was missing in FH2. When creating the gaming area I decided to choose a terrain that had the Psel river in the northwest, the village Storozhevoe in the southeast, Prokhorovka in the northeast, and Komsomolets and Oktiabr'skii farms in the center. That area in reality covers ~ 350 square km's and has for gaming purposed been downscaled to 4 ingame square km's. In this area 3 German SS divisions and a variaty of Russian divisons where fighting which allows for a nice vehice layout. 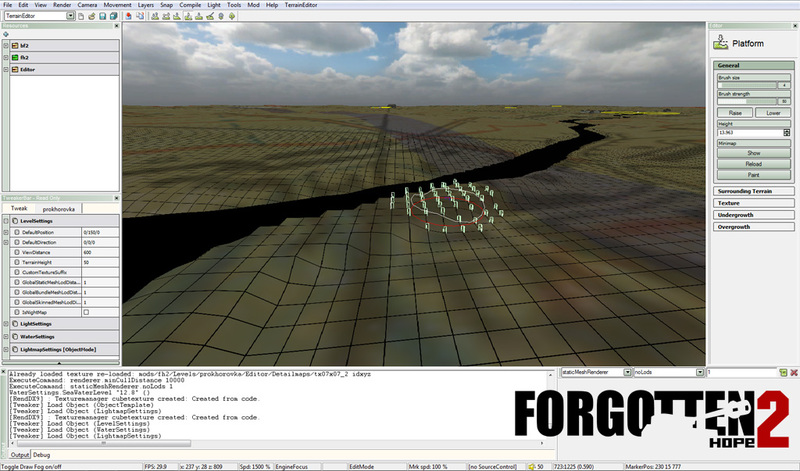 The next step was to create a rough heightmap that is based on real terrain. Take a look at the heightmap itself and note the accordance with the topographic map. The actual concept of the map is a head on tank combat over 4 captuarable flags. Both teams bleed at the beginning of the round and a team can stop the own bleed by holding more flags than the enemy does. The map is divided in three parts by the river in the north and the railroad line in the south. The Terrain in the middle of the map is a little bit wavy and mostly open. Not in the concept drawing but certainly in the map is the famous AT ditch in the depression between both farms. The southern part is wavier and has more overgrowth which allows for better cover, while the northern part is more flat and open. 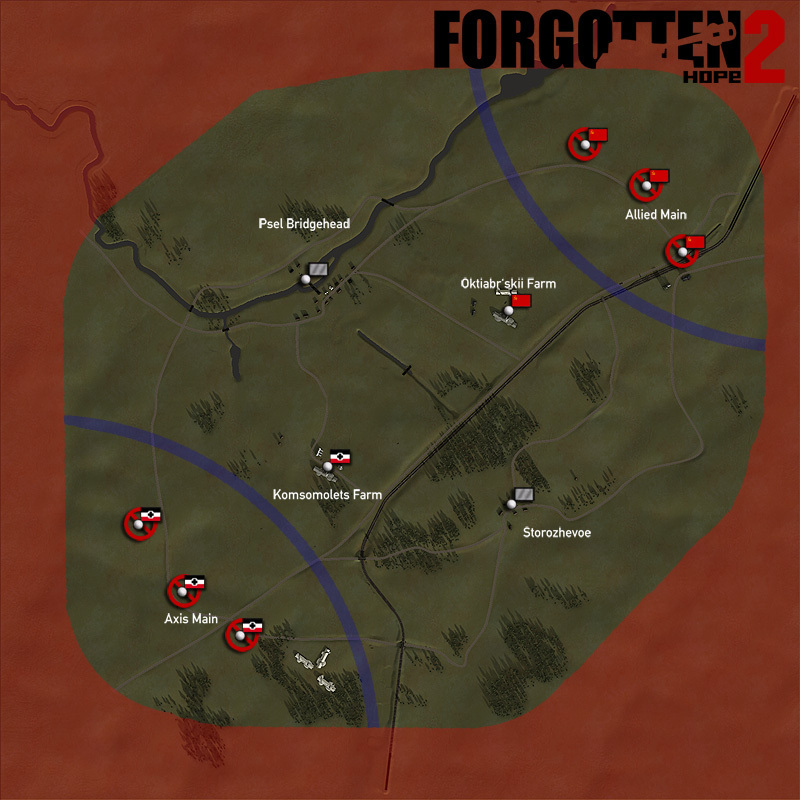 The engaements in open terrain will mostly happen between tanks, infantry has the chance to man defencsive positions aroundthe flags. Next time I will show the first steps in BF2 editor. 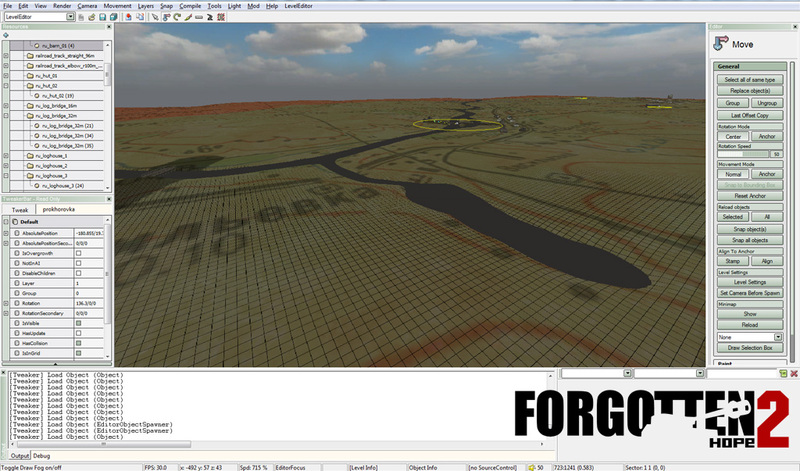 After concept and heightmap creation it is time now to create the actual map in editor. 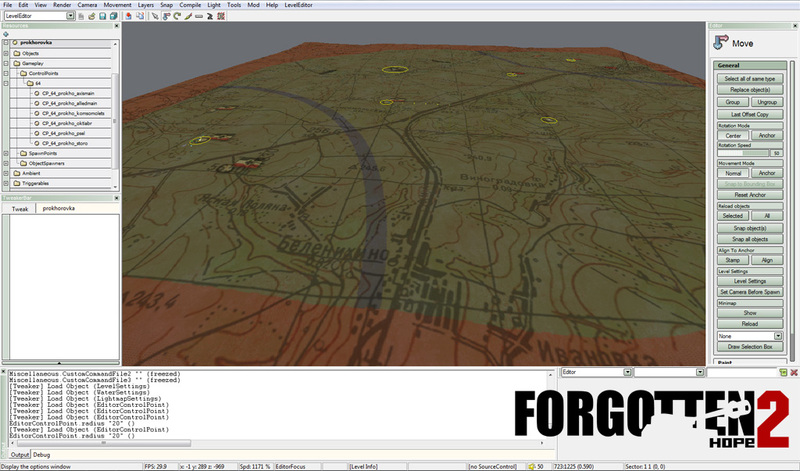 I imported my heightmap and used the actual map extract I was basing the map on as ground texture. To make it not blind my eyes while working, I gave ita dark green overlay. This texture helps me alot to orientate on the otherwise still empty map and is the rough plan of how I'm building my landscape. The next thing I do is to place all the flags, add some spawnpoints and some vehicles and buildings at each flag. 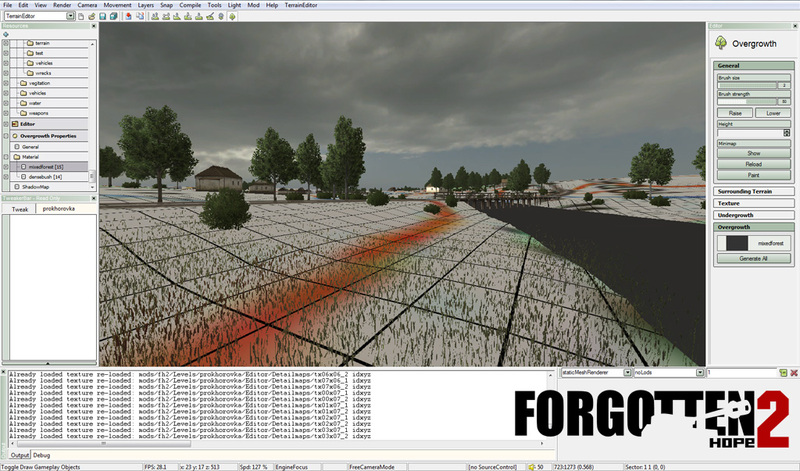 This is followed by the first ingame test, to check out if the scale is working out like planned, distances between flags are good and if the terrain height differences feel right. If all that turns out like expected, my next step is to create the main terrain features. In this case the railroad line in the south and the river in the north. Those two terrain features are very importatnt since they divide the in 3 main parts. Before starting to work on any of the other areas of the map I want to have those roughly done to be able to build the rest of the map around them and design the gameplay so that those features actually have a impact. 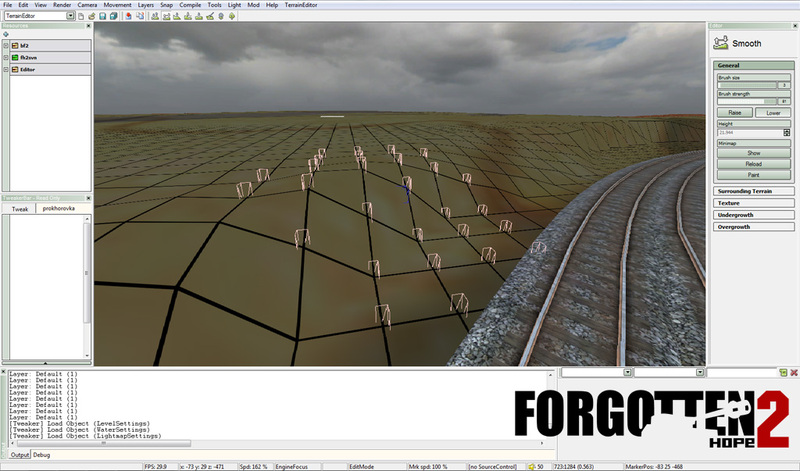 To do that i adjust the terrain, so it forms a river, create embankments and cuts for the railroad line and place the tracks. All heightmap work is rough. I will have to overwork it later anyways, so there is no need to waste too much time on it. Running into first problems. A big problem on this heightmap is that the river area is very flat. To minimize flickering through water when looking from a distance I raise the terrain around the river and make the river banks steeper. 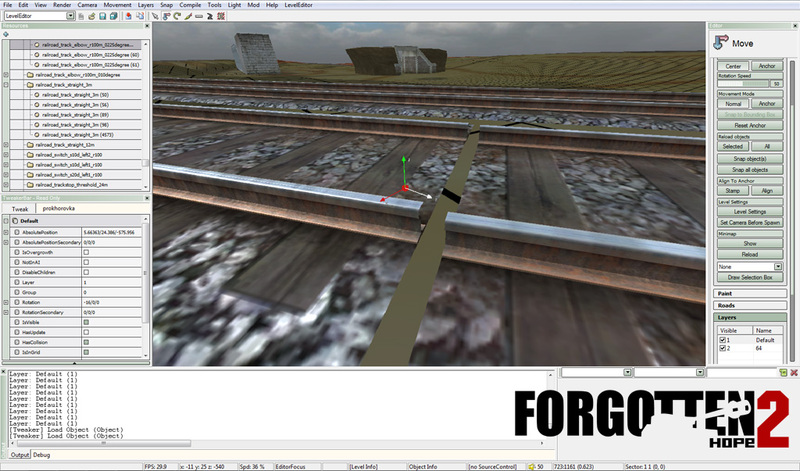 Placing railroad tracks is tricky and has to be done with care. If you don't 100% correct attach them to their neighbor you get crazy flickering. To get it as perfect as possible get close to the rail and look at from several directions. Smoothing the terrain at cuts and embankments so much that I don't have too nasty parts but saving time because I will fine tune this anyways at a later stage. Another thing I do right at the start is to create the most important roads. Nothing fancy, just some splines with a road texture that again mostly give me orientation when working in editor and checking things out ingame. Additionaly I placed some more buildings and some overgrowth which also help me to get the scale right while further working on the map. Right now they are just thrown at some place where i might use them later but doing this also gives me ideas on how to actually place the statics later. Have a nice evening, till next time. 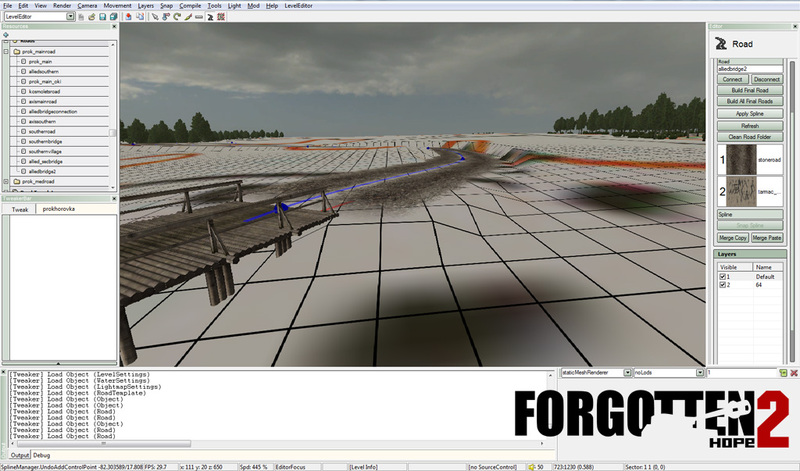 When building a map it is very likely that at one point your work is being halted for some time. In this case due to several reasons I even did not work on the map for more than 3 months. In mid December I slowly started to get into the project again and am hoping to be developing at full speed sometime soon. Since the basic setup was more or less done, I decided to place some tanks on the map and as I'm sure some of you have witnessed, have a first playtest. 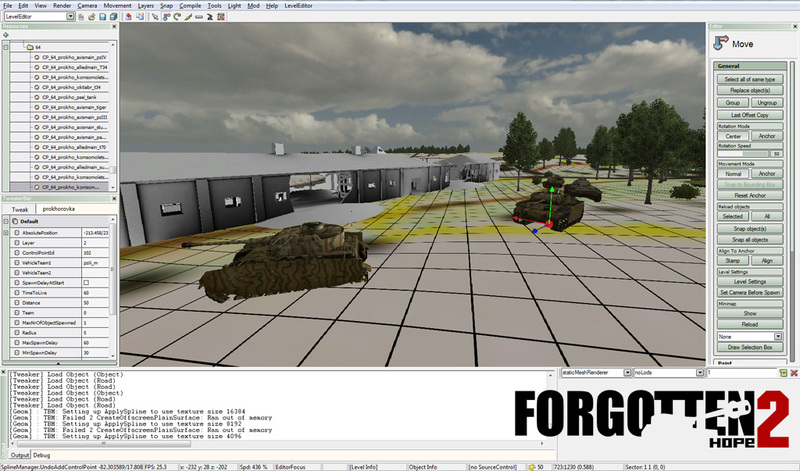 The goal of this playtest was to find out where exactly I have to do improvements in the maps composition to make tank combat as interesting as possible. As you can see on the minimap the map in the current state was rather plain, so there is plenty of room to do terrain modifications, place statics and overgrowth to ensure that tank fighting works . One thing I realized pretty fast was that the routes to the flags needed to be altered. With building new roads using the road and apply spline tool I try to make sure that important sections of those roads are better positioned on the map and also ensure that both teams have suitable routes to the flags. 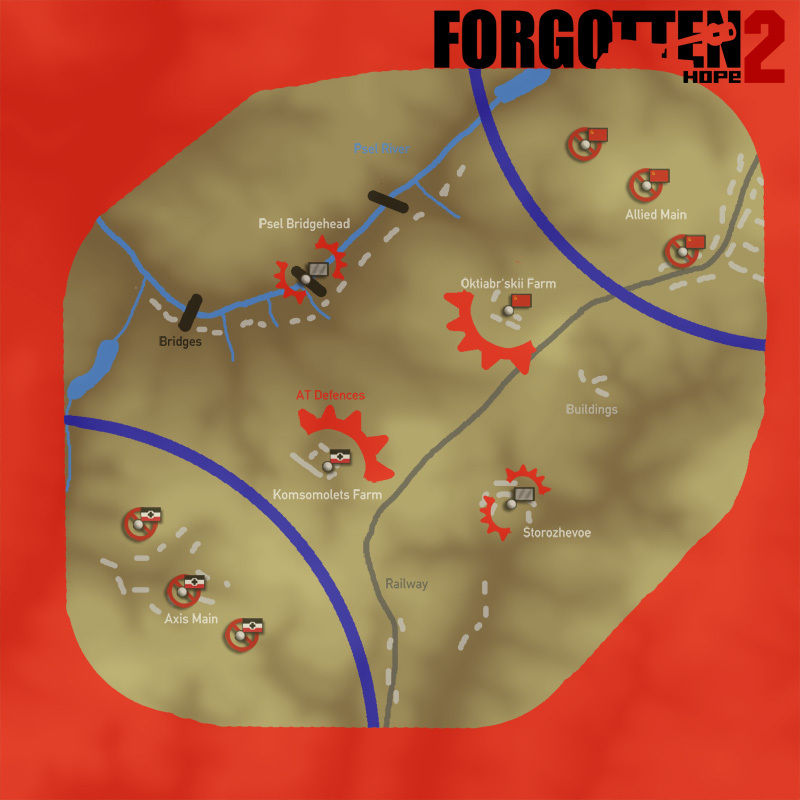 Another thing to improve routes to the flag area is providing more cover, which can be done by changing the terrain, but in the rather flat river area of the map is mostly done with placing objects and overgrowth. For now all object and overgrowth placement is still makeshift and only has the role to be there and give me a better image of how the map is going to play out later. While being at changing terrain features to a higher detail level I also for the first time started to think about on how to implemet my ideas of how the map is supposed to look. For now this is kept to a rather low level and is limited to creating flat terrain right next to the river that will later have a swampy look and is covered with reed or similar plants that grwow under such conditions. That's it for today. Thanks for your patience and I'm hoping to be able to post here more frequently again. bolji MOI that looks dam amazing! T34"s! T-70's! Churchills! Panzer IV's!Panzer 38's! And a tiger or so! Was waiting long for a map yo be announced. Awesome! God dammit I am so exited now! 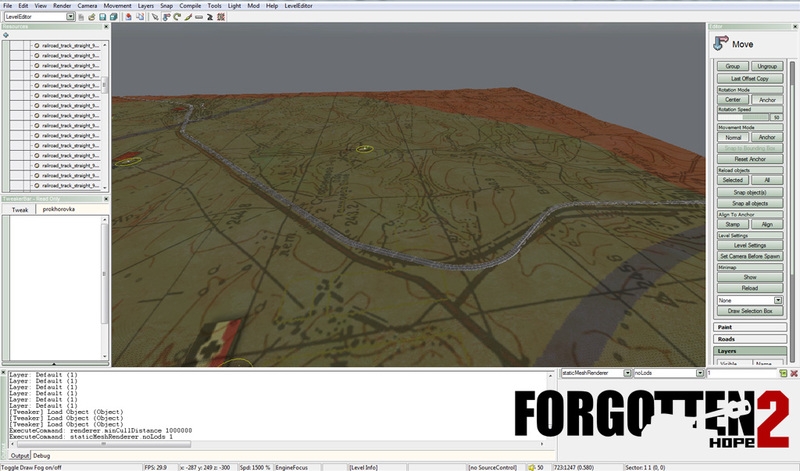 Thanks for sharing a devekopnment process of a map with us and ecpacially THIS map, awesome! I keep appreciating FH more and more for those little things and since we get to know how much work and research is being put into a map I have evven more respect for all the devs. Awesome, looks a lot like the FH1 map. Myth #5: The weather at Prokhorovka was clear and dry. Most popular accounts of the battle at Prokhorovka feature swirling tank battles kicking up enormous clouds of dust. Nothing could be further from the truth. We already know that there were no swirling tanks battles at point blank range. Nor was there dust. The ground was waterlogged, and the weather during the battle featured occasional thunderstorms. According to the reports of LSSAH, July 9th was "dreary and rainy" and July 10th featured "heavy showers which hampered [the] division's movements". For July 11 and 12, the division reported that there were "heavy downpours which severely hampered combat operations" and that the roads were "in very poor shape". These are hardly the conditions that would allow for huge clouds of dust to be kicked up! Hoping to be a exellent EF map, FOR MOTHER RUSSIA!! My main and only hope is that the map will represent the actual conditions of the battle, which was rainy, overcast, and muddy. for the german tanks. IIRC its the Panzer III ausf J-L and N. Panzer IV ausf G, Stug 3's and Tiger tanks. As for planes. The soviets fielded Yak-9's, Il-2's, PE-2"s and tupolev SB's. But the germans, i dunno. ME-109's and JU 87's for sure. ME110? JU88? Even though it won't be made, could you show the concepts for Ponyri too? Why won't Ponyri be made?